A Modern Quilt-Month 5/Come Fly With Me…..
July is here already and we are ready to take off…with our Flying Geese. This is the last pieced block we will make for our Modern Quilt top. Barbara Brackman’s Encyclopedia of Pieced Quilt Patterns “dates the first flying-geese patterns ever published back to 1894”. 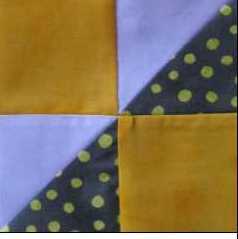 It is still one of the most popular pieced blocks in quilt making because of its versatility. This month we will make 4 of these blocks and fill in the gaps of our quilt top grid. Directions are provided as a free download as they are every month. These directions are written to utilize the beautiful charm square collections that come from the fabric companies cut in 5″ squares. 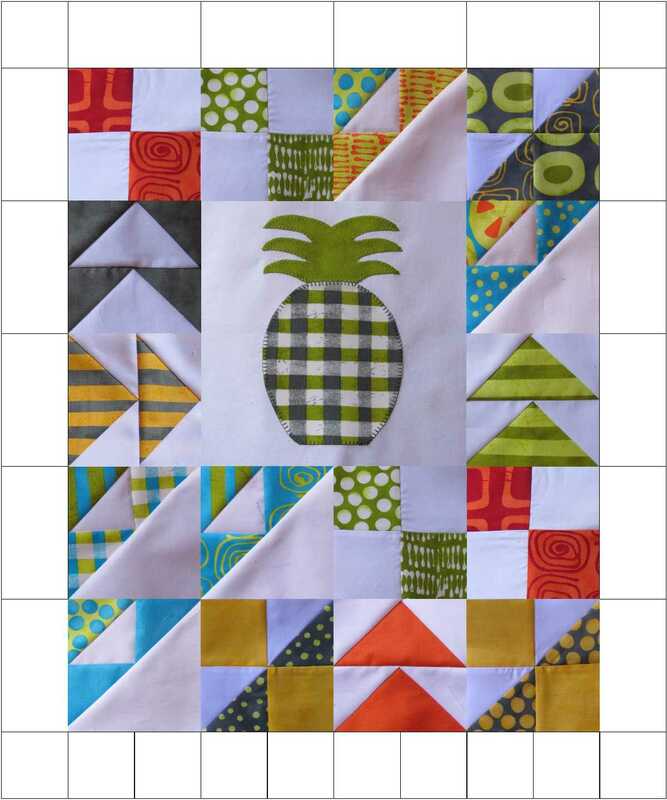 If you are making A Modern Quilt from your fabric stash you may want to have a look at www.quilterscashe.com. Marcia Hohn provides directions for several other methods. There will be several chances to win some wonderful lucky draw prizes just by uploading photos of your WIP (Work in Progress) after Month 5 (THIS MONTH) and again with photos of your finished top after Month 10! Go to Flickr to join our Block of the Month group and upload photos of your work. Tuesday Treats: How do YOU trim a triangle? 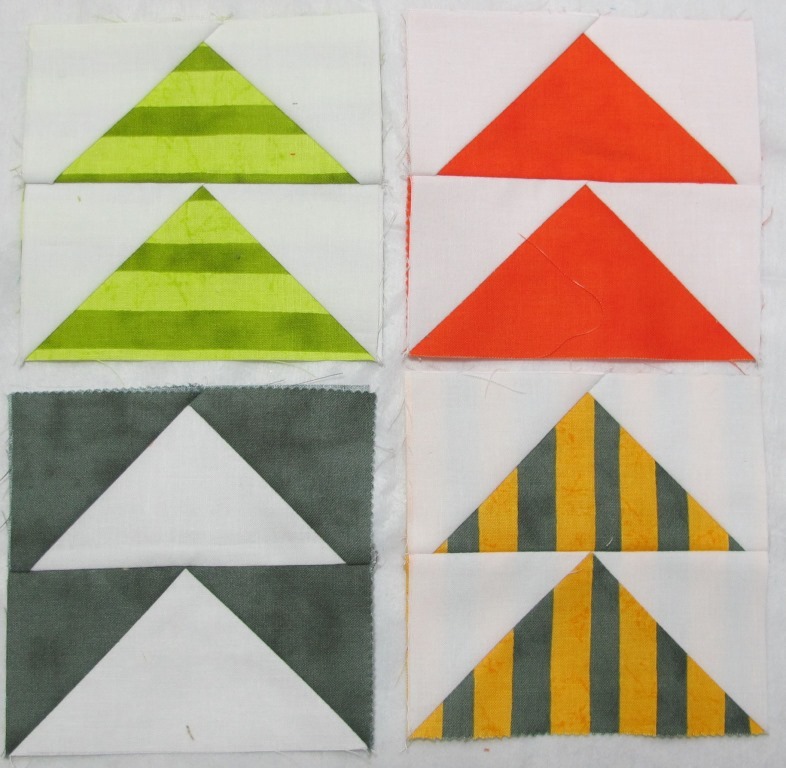 If you have been following our Welcome Quilt block of the month you know that several of the blocks in the quilt use Half Square Triangle (HST) units. This HST building block unit gives you access to a multitude of design options but it is critical to get the diagonal line as accurate as possible when trimming. I’ve always pressed the square open, then used a small square ruler to align the diagonal line with the seam line, before trimming the square to size. So I found the technique displayed in the “More than One Way to Skin a Triangle?” post very interesting. Sarah demonstrates a different method, trimming the blocks to size before pressing them open, that will still keep the diagonal seam line accurately positioned from corner to corner. However, she does highlight a possible point where errors could occur if you have used a thick thread for piecing the blocks. So do read the instruction fully before attacking your squares with the rotary cutter & ruler. I was pleased to see that she mentioned that you should not need to use the “scoot” adjustment if you are piecing with a fine thread such as Aurifil Cotton mako’ 50 (or Mako’ 40). The next step in the making of the Modern Welcome Quilt will be posted later this week. There are still a few more sets of instructions to be posted so don’t forget to come back on the first Friday each month.